Juices in the seeds of host plants. In Minnesota the only host plants are silver maple (Acer saccharinum) and boxelder (Acer negundo). Leaves, flowers, twigs, and bark of host plants; fruits; other boxelder bugs and eggs. This species was previously known as Leptocoris trivittatus. 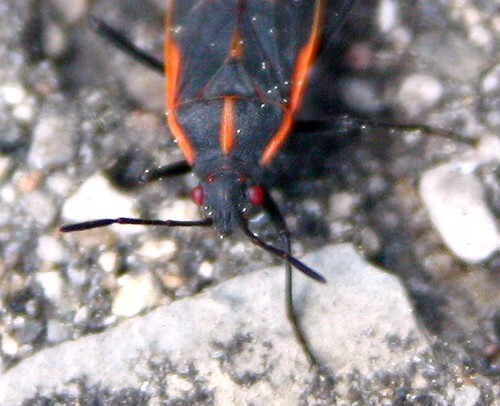 The boxelder bug (Boisea trivittata) is a North American species of true bug. It is found primarily on boxelder trees, as well as maple and ash trees. The adults are about 12.5 millimetres (0.49 in) long with a dark brown or black coloration, relieved by red wing veins and markings on the abdomen; nymphs are bright red. These highly specialized insects feed almost exclusively on the seeds of Acer species. The boxelder bug is sometimes known as a garage beetle or may be confused with other Jadera spp., especially Boisea rubrolineata. The name "stink bug," which is more regularly applied to the family Pentatomidae, is sometimes erroneously used to refer to Boisea trivittata. Instead, these insects belong to the family Rhopalidae, the so-called "scentless plant bugs". However, boxelder bugs are redolent and will release a pungent and bad-tasting compound upon being disturbed to discourage predation; this allows them to form conspicuous aggregations without being preyed on. Although they specialize on Acer seeds, they may pierce plant tissues while feeding. They are not known to cause significant damage and are not considered to be agricultural pests. Removal of boxelder and other Acer species can help in control of bug populations. They may form large aggregations while sunning themselves in areas near their host plant (e.g. on rocks, shrubs, trees, and man-made structures). However, their congregation habits and excreta can annoy people; thus, they are considered nuisance pests. This is especially a problem during the cooler months, when they sometimes invade houses and other man-made structures seeking warmth or a place to overwinter. They remain inactive inside the walls (and behind siding) while the weather is cool. When the heating systems revive them, some may falsely perceive it to be springtime and enter inhabited parts of the building in search of food, water, and conspecifics. In the spring, the bugs leave their winter hibernation locations to feed and lay eggs on maple or ash trees; aggregations may be seen during this time and well into summer and early fall, depending on the temperature. Photographed at the Turtle River State Park, North Dakota (18 February 2012). According to the NWS at Grand Forks, today's high temperature was an unseasonably warm 38oF. Photographed near Fisher, Minnesota (09 October 2010).